Note: Simple volume calculations are available in the geometry tab of the Map view. If reservoir characteristics such as net/gross, porosity, and fluid data are entered, the wizard also calculates fluid in place and recoverable hydrocarbon volumes. The results are presented in a table for copying into a report, text editor or spreadsheet. In the single case, the volume (shaded) is calculated between a single top surface and a flat contact. In the dual case, the volume (shaded) is calculated between a pair of surfaces defining the top and base of the structure, and a flat contact. Use Required (link) parameters to define the top and base of the structure and specify a range of contacts and an interval to output results. This will generate a table of area-depth-GRV at specific intervals throughout a structure. Add Optional (link) parameters so that reservoir information such as net/gross, porosity, and fluid properties can be included to calculate in place and recoverable hydrocarbons. Adjust these parameters to define the top and base of the structure and specify a range of contacts and an interval to output results. This will calculate area-depth-GRV at specific intervals throughout a structure. Top Structure: Choose a horizon or specify a constant to define the top of the structure. If a horizon is chosen, an offset distance above or below (TVD) can be added. The horizon must be in depth or convertible to depth (see How it Works (Time-Depth Conversion)). Base Structure: ("Dual" case only): Choose a horizon or specify a constant to define the base of the structure. Contact(s): Choose Horizon, Constant, or Multiple Constants to define the contact. Multiple Constants: one or more depth values (separated by commas) AND/OR a sequence (as min-max[step] format). Units: Choose the units to use for the output, including oil and/or gas volumes if Oil and/or Gas ratios are provided. Polygon: Constrain the area of calculation with a map polygon. If a polygon is not selected, the area is defined by the entire horizon. A polygon must be selected if constants are used for the structure and contact(s). 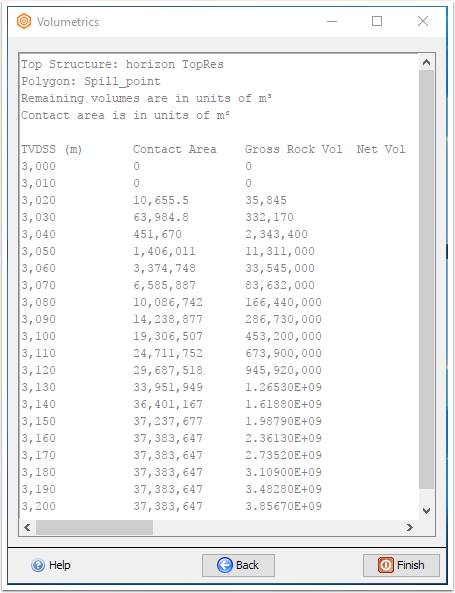 Note: Volumetrics calculates the Gross Rock Volume (GRV) unless the following optional parameters are specified. Fill in these parameters so that reservoir information such as net/gross, porosity, and fluid properties can be used to calculate in place and recoverable hydrocarbons. Note: For the remaining parameters, provide a single constant or a horizon to define a spatially varying value. Porosity and Water Saturation are interpreted as ratios (0 to 1) or as percentages (0 to 100) if any value in the horizon is greater that 1. Provide Net/Gross Ratio to calculate net volume. Valid range: 0.0 to 1.0. Provide Porosity to calculate pore volume. Valid range: 0.0 to 1.0 (or 0.0 to 100.0). Provide Water Saturation to calculate hydrocarbon volume. Valid range: 0.0 to 1.0 (or 0.0 to 100.0). Provide Oil Formation Volume Factor (also called shrinkage factor), to calculate stock tank oil originally/initially in place (STOOIP/STOIIP). This parameter converts the volume of oil at reservoir conditions to the volume at the surface. The value varies depending on the fluid and the temperature and pressure of the reservoir and the surface. Typical values are from 1 to 1.7. Provide Oil Recovery Factor to calculate estimated ultimate recovery (EUR) volume. Valid range: 0.0 to 1.0. Provide Gas Formation Volume Factor, to calculate original gas in place (OGIP/GIIP). This parameter converts the volume of gas in the reservoir into the volume at the surface. The value varies depending on the fluid and the temperature and pressure of the reservoir and the surface. Typical values are below 0.1. Provide Gas Recovery Factor to calculate estimated ultimate recovery (EUR) volume. Valid range: 0.0 to 1.0. Note: If a horizon is provided as the structure or contact, the horizons must all be consistent. For example, if a horizon has an undefined location, each horizon provided must have the same undefined location within the polygon (if selected). Click Next to perform the volumetrics calculation. Contact Area = The total area of the contact as it intersects with the volume. Copy the content to the clipboard by right-clicking anywhere in the window and selecting Copy. Click Finish to close the Volumetrics wizard. In this example we’ll create a table of area-depth pairs based off a top structure horizon and multiple contacts at a 10 m interval. This table can then be copied into a spreadsheet, text editor, or other program. Select single so that only a Top structure and contacts need to be defined. Optionally add a polygon to define the closure of the structure. Click Next to generate the results. 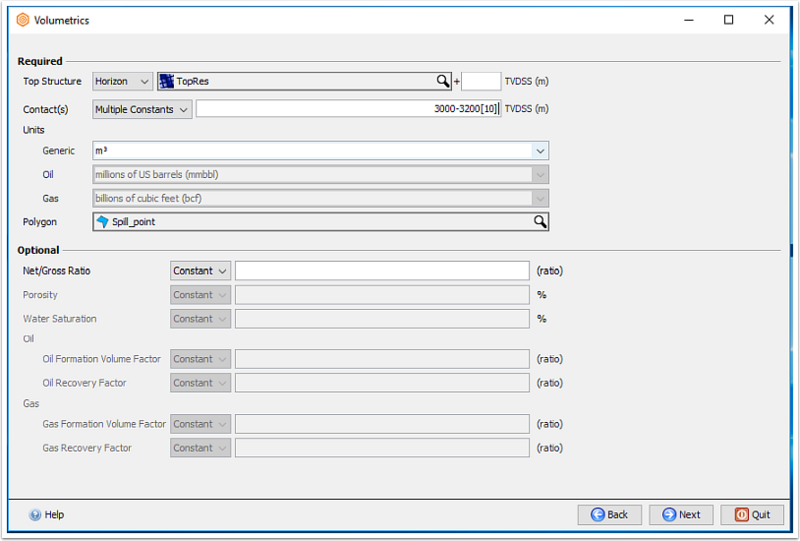 Example 2: Generate a table of fluid volumes in place and recoverable hydrocarbon volumes using additional reservoir data.